After I finished my English degree, I sold a lot of my books. I guess I decided that I didn't want to pack them all, so I picked out a few I thought I'd read again and sold the rest to a used bookstore. I suppose it was a smart decision – books are pretty heavy – but I do wish I'd kept more of them because every once in a while I still want to look something up or reread a passage. Of the books I kept, I've recommended several to friends, but for some reason I'm always careful about suggesting Ford Madox Ford's novel The Good Soldier. 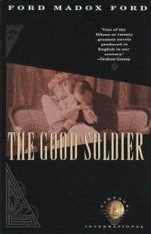 The Good Soldier is set during the early 1900s and told entirely from the perspective of John Dowell, a wealthy American living in Europe with his wife Florence. He and his wife are friends with the Ashburnhams, a wealthy English couple, and the four of them get together annually to take in the healing waters at the Bad Nauheim spa in Germany. It may not sound like the most exciting premise for a novel, but that's because the real gem here is the lens through which John Dowell, the narrator, sees everything. The novel takes place over several years and is told in a series of memories that are not always chronological. Dowell takes his time unfolding what happened, as if he is trying desperately to figure it out himself. Essentially, though, Dowell chronicles Edward Ashburnham's affairs over the years – including the one with his wife – eventually getting to the most scandalous: when Edward falls for his wife's much younger ward Nancy. I don't want to give away the ending, but I will say that despite Dowell's admiration for his friend, even he cannot hide the fact that Ashburnham's affairs always end destructively. Not that Ashburnham is a violent man – he's kind of sad, really – but the women just never seem to deal well with the end. John Dowell is, it must be said, quite clueless, but he nevertheless relates everything that happens in the couples' friendship, he just doesn't really understand what's going on. For example, he has no idea that his wife is faking her heart condition so that the couple will be forced to stay in Europe where she can carry on multiple affairs. Likewise, when he finds out that his wife is sleeping with Edward Ashburnham – arguably his best friend – he cannot comprehend that this also means Edward has been sleeping with his wife and thus betraying him. John Dowell is an incredibly frustrating character, and having the entire story mediated through him can drive you crazy at times, but he also brings ironic humour to the novel, which would be quite depressing without him. In a way, this is a novel about self-deception and hero worship. Dowell idolizes Edward Ashburnham and forgives or excuses all his varied sins, including his constant philandering. In a way, Dowell is like a child who can pick up all the individual pieces but just can't quite put them together. And as a result he is taken advantage of and deceived time and time again. But it may also be that he prefers it this way. Dowell seems largely unaffected by things – including his wife's suicide – and is able to live in a serene bubble while the lives of those around him fall apart. Dowell's narration is rather like walking through a hall of mirrors: he is reflected in everything, and everything he tells you contains hints of the past and future. Ford's writing exposes Dowell – and those like him – as people trapped by their own refusal to see beyond themselves and insular, reflective worlds. But The Good Soldier is not entirely grim. There is a lot of ironic humour, and because no one "wins," you are saved from wondering what it was about. It is a novel about a time in history – pre-WWI – in which morals and values were supposedly universal; Ford exposes these artificial values precisely by presenting us with a character who holds them high, and thereby cautions against insulating yourself from the truth. And as old-fashioned as some elements of this novel may now seem, that is perennial good advice.